Jim’s brother and sister-in-law came to Atlanta for a visit this weekend. Since they were on a mini-vacation and since indulgence is part of a vacation, I decided that I might as well indulge myself. I don’t think it should be a surprise that I’m referring to indulgences of the food variety. I couldn’t let Joe and Elaine go home and tell their friends that they didn’t have good food at our house, could I? Over the weekend, one might have spotted smoked baby back ribs, crab cakes with chipotle tartar sauce, creamed corn, fried okra, linguine with garlic and olive oil, lemon icebox pie, peach pie, and ice cream passing across our table. There may have also been several (and I mean several) empty wine bottles in our recycle bin when all was said and done. Suffice it to say that starting today, we’re back on the program. I believe that healthy living has plenty of room for occasional indulgences as long as you can quickly get back on track. Everything in life is about balance, and if I can stick to 80% healthy eating and 20% indulgence, I’m happy. For today’s post and my attempt in getting back to something light, I made middle eastern chicken kabobs along with Israeli couscous tabbouleh. To start the dish, I marinated the chicken in yogurt flavored with smoked paprika, cumin, coriander, turmeric, lemon, and garlic. After several hours in the marinade and a few minutes on the grill, the skewered chicken and peppers were perfectly done and ready to eat. Tabbouleh, a vegetarian dish originating in Lebanon, typically consists of tomatoes, parsley, mint, onion, bulgur, lemon juice, and olive oil. In this recipe, I used Israeli couscous instead of bulgur. The granules are larger than traditional couscous and I like the texture it added to the dish. Tabbouleh can be prepared ahead of time and stored in the refrigerator. If you do prepare it ahead of time, leave the parsley and mint out and add immediately prior to serving. If you’re looking for a lighter summer meal and if you like middle eastern flavors, try this recipe. 1. In a small bowl, whisk together yogurt, paprika, cumin, coriander, tumeric, lemon zest, lemon juice, garlic, olive oil, salt, and pepper. Place chicken in a 1 gallon food storage bag. Add yogurt mixture to bag and securely close. Toss to make sure each piece of chicken is covered with marinade. Refrigerate for 3 hours up to overnight. 2. Soak 8 wooden skewers in water for 30 minutes. Skewer chicken, peppers, and onions. 3. Heat grill or grill pan to medium high heat. Grill skewers for 4 to 5 minutes on each side or until chicken reaches an internal temperature of 165 degrees. 1. Bring water to a boil. Add 1 teaspoon of salt and couscous to water. Reduce heat, cover, and simmer for 7 to 8 minutes or until couscous is al dente. Drain, rinse with cold water, and transfer to a medium bowl. 2. Add cucumber, tomato, onion, olive oil, lemon juice, mint, parsley, and 1/2 teaspoon salt. Mix to combine. If making tabbouleh ahead of time, combine all ingredients except mint and parsley. Keep refrigerated until ready to use. Add the herbs immediately before serving. Thanks for sharing your thoughts about middle eastern chicken kabobs. After seeing what you dish up for your weekend guests, I’ll give you fair warning, that I’m on my way!!! You really spoil your guests! I can see why you had to go light but I’m sure it was all worth it. Israeli couscous is one of those ingredients that I discovered through blogging. After trying it for the first time, Bobby and I both decided that regular couscous was a thing of the past. What a great ingredient! 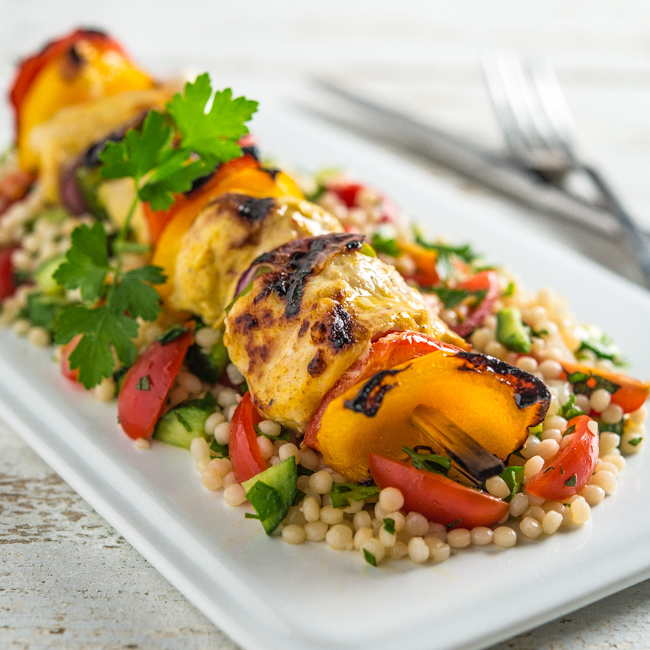 I love the tabbouleh you made with it and of course – the chicken looks like the perfect complement! Thanks for sharing such a great meal! I agree with you about the couscous, MJ. I’ll never go back to the little variety! Thanks for the comment! I can’t tell you how hungry you’re making me right now, Bill! Gorgeous photos and scrumptious recipe. Thanks for sharing. Thank you so much, Nancy. BTW, thanks for the post on Grammarly.com. I’ve already signed up and I love it! These look amazing! So colorful and I love the yogurt/cumin/coriander marinade! Absolutely delish!! Sounds like you had a heck of a weekend!! That food lineup was legit awesome! And loving these kabobs. Great photos!! Wow, these look so fantastic, Bill!! Your photos are just gorgeous too… I wanna reach through my screen!! Thank you, Natalie! I really appreciate your comment! Love this! So perfect for the hot weather we’re having, and so healthy too. So I can indulge at other times. 😉 Good post — thanks. I came for the gorgeous pictures but I’m sticking around for the amazing food. This is a must try! Thank you so much for the compliment, Maggie. I certainly appreciate your visit! These look so wonderful and colorful! Thank you, Rachel. I appreciate you dropping by! These look so healthy and delicious! I bought a huge container of Israeli couscous at the Delkalb Farmers Market several months ago and I have yet to make anything with it! I think this looks like a fabulous place to start! Pinned! This looks amazing! Love the fusion of flavours- definitely the perfect summer food! Thank you, Jess. Thanks for visiting! I seriously can smell and almost taste the flavor in these! I want these on my grill now!